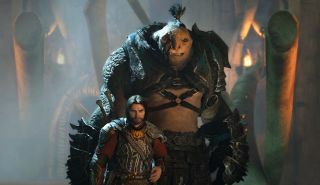 When Middle Earth: Shadow of Mordor was first released back in 2014, it introduced the world to the 'Nemesis System', a gameplay mechanic that has Modor's hoards of Orcs responding dynamically to how you play the game. It will come as no surprise that its sequel, Shadow of War, features some big improvements to the Nemesis system. But in developer Monolith's eagerness to bolster the impressive system, it risks committing the cardinal sin of prioritizing it too much over the player's Orc-slaying. The game's associate producer Evan Nickel explained the team's priorities when crafting the sequel, "We wanted to make a 2.0 version rather than a 1.5. So we took every single aspect and we dialled it up to 11. Every single aspect of this game is massively improved. The RPG systems are improved, with all the different gear that you can pick up, and that's all random and computer generated, and they all have missions tied to them. "The skills and abilities are all massively upgraded, the abilities that enemies have are upgraded," Nickel continued, "The different things that can happen from a Nemesis standpoint, everything has been dialled up to 11." So whereas the previous game's Nemesis system allowed friends and foes that you met in the game to remember you, and respond to the the outcomes of your previous meeting with them, the new system allows more functionality such as having your own troops remembering how you’ve treated them and react differently to you based on your actions. So if you abandon some troops in order to win a battle, the surviving members of that unit will be more likely to rebel in the future. What are going to do? Talk me to death? It’s brilliant. It genuinely is. There’s something about the game morphing and shifting around you that makes it so much more real. But the problem with it is that Nemesis mode doesn’t just quietly get on with it behind the scenes. Every single character that has been affected tells you about it. And boy do they tell you. When we had time with Shadow of War at Gamescom, we took a little while to get to grips with the controls and so, as a result, we died. A lot. Unfortunately, what this then meant was that every time we started to play the demo again, we were treated to a good few minutes worth of monologuing from the various enemies that had vanquished us in previous turns. This would be fine if you could skip them, but you can’t. You just have to sit there and listen to the gravelly faux-cockney posturing of Ognog the Tark Slayer. We’re getting frustrated just writing about it. Wait, maybe that’s the point. Maybe it’s supposed to rile you up to the point where you just want to javelin them through the heart to shut them up. Yes, this problem slowly disappears as you get to grips with the game, but its these early stages where you're most eager to get on and actually play, rather than later on when you're more invested in your relationship with the world. The unskippable element of Nemesis mode isn’t new to this game; in Shadow of Mordor, there would be long unskippable sequences where the hierarchy of troops would get rearranged after significant events. It's not a new problem exactly, but it's more pronounced with the added complexity of the enhanced system. Ironically, all of this is actually quite Tolkien, the intensely detailed, unskippable information about regions and cultures. This exposition is tonally accurate, but mechanically frustrating. It makes sense that the games developers would want to show off all the amazing work that the Nemesis system is doing behind the scenes, but we really hope by the time it comes out in October that there'll be an option to skip some of these scenes or even just truncate them, because it was the only problem we had with an otherwise very enjoyable game.